Home Blog Superintendent’s sign deals a low blow — and a misleading one! Superintendent’s sign deals a low blow — and a misleading one! 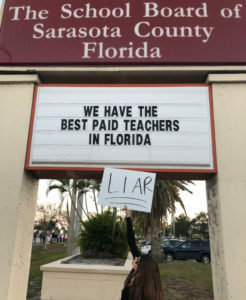 This sign, posted by the School District administration before Tuesday’s historic teacher’s rally, gives the misleading impression that Sarasota’s teachers are the state’s best paid. This is what our superintendent wanted you to think. So I started pulling data off of the Department of Education website. I found that our superintendent’s sign was simply not true – at least for 2013 through 2016, the latest year there is data available. We were not the highest paid teachers in the state. This means our district administration expects us to believe that they sat down Tuesday afternoon, pulled salary and benefits and retirement information for all of Florida’s 67 school districts, and compared them? Sorry, but no such data exists. Our superintendent put that sign up to belittle our teachers and staff, and diminish the validity of our wonderful rally on Tuesday. He was trying to make our teachers look like greedy beggars, by asking for better pay. What superintendent would do that to their teachers? Wilma Hamilton would never have done that. Gary Norris would never have done that. Gene Witt would never have done that. Lori White would NEVER have done that. This shows you the character of our present superintendent.